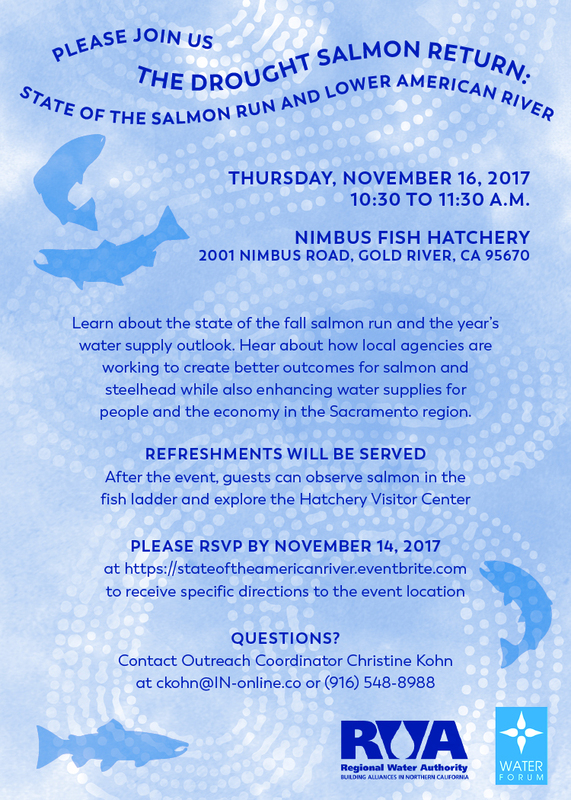 Please join us at “The Drought Salmon Return: State of the Salmon Run and Lower American River Event” on Thursday, November 16, at 10:30 a.m. at the Nimbus Fish Hatchery in Gold River, sponsored by the Regional Water Authority and Water Forum. Experts from the CA Dept. of Fish and Wildlife, Water Forum and RWA will be talking about the state of the fall salmon run and the year’s water supply outlook. You can learn about how local agencies are working to create better outcomes for salmon and steelhead while also enhancing water supplies for people and the economy in the Sacramento region.